What is the benefit of adding a CAPTCHA field? The answer is simple, a CAPTCHA helps protect your forms against spammers and spambots that are programmed to attack websites flooding them with tons of unwanted information by requesting that a physical code word is typed into the box to be matched and checked. Before starting, there are 2 types of CAPTCHA when using the default one; CAPTCHA and re-CAPTCHA. We’ll show you the difference down below. 2. 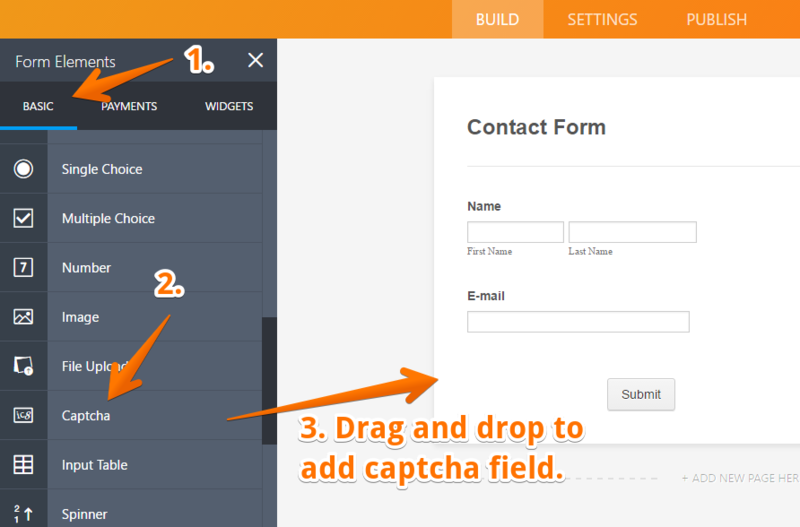 Find in the list the "Captcha" field and add it in your from by drag and drop. 3. If you want something more complex to provide a higher level of protection, you can turn on reCAPTCHA. This option serves as a means of double-protection by making it even harder to enter or bypass. Be advised: in doing so you may irritate your customers. You're done! It's really that simple! When you use a CAPTCHA field, you do not have to set it as a required field. It is already automatically set to “required” when you place it into your form. Also please note how a CAPTCHA field works. If a person enters the correct CAPTCHA, the form is accepted. However, if an Incorrect CAPTCHA is entered, it will lead to a secondary CAPTCHA. The secondary CAPTCHA will appear in the middle of the page. If a valid CAPTCHA is entered there correctly, the submission will finally be accepted. How did it go? Please share your thoughts and experiences in the comments section below. Just want to let you know of a typing error. I dislike being negative, but I thought you would like to know. "If you a valid CAPTCHA is entered there correctly," needs correcting. Não estou conseguindo incorporar o formulário que criei aqui nesta plataforma no meu site. Vocês podem me orientar porque? Hi, my recaptcha isn't working on mobile versions. It isn't displaying the full picture (only showing half of the bottom row) meaning people can't enter the correct answer/ can't submit my form. it won't stop trying to load until i click the accept button then the rest of the form disappears and only Captcha remains then you are able to enter the character sequence and the form is accepted. How do I fix this loading issue. It keeps reloading my on site with in the form? new captcha ? on facebook ? Surprise ? Why do I have to type the captcha text twice?